HISTORICAL ACCURACY and FUN-FILLED EXPERIENCES are the cornerstones of Magic Tours. To better serve and delight guests, quality and varied offerings are continually added to the menu of tours. To comprehensively inform and entertain, special tours are customized to meet needs and desires upon request(s). Established over 25 years ago, Magic Tours is the oldest walking tour company in New Orleans. Our guides are educated professionals who undergo extensive vetting and training before they become tour guides. They delight in sharing the marvels of our 300-year-old city. Building on knowledge derived from experience, comments from our guests, and information from research we strive to constantly improve our offerings. Oversight over all tours and activities is conducted by the owner, Stan Gallien, Ph.d., retired professor of history; and by Dawn Grosheider, General Manager, who has years of experience in the Tour Industry in New Orleans. Since its founding, New Orleans has suffered more disease, disasters, destruction, and death than any other American city. Spirits are taken for granted here! The influence of Voodoo has been profound and it seems that almost every building has its own haunting story. Even the sidewalks and rooftops have their resident ghosts and spirits. Our Ghost Tour is a historical, fun-filled, and chilling after-dark walk around the Quarter’s edges in search of the living dead. Magic Tours created and nurtured this unique New Orleans haunted tour that is now imitated by so many! Some do it passably, other do it embarrassingly. We do it professionally and are proud to call it our own, since 1992. Join us to hear ghost stories, tales of vampires, and Voodoo legends. New Orleans is known for its unique cemeteries and burial customs – including above-ground graves. 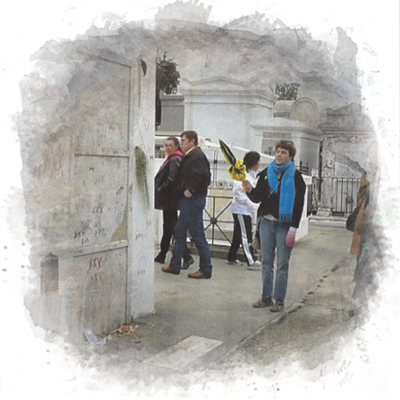 At Magic Tours, we offer unique St. Louis Cemetery tours in New Orleans, giving guests the full experience of being in the presence of these old and sometimes very famous graves! Our cemetery tour guides have an immense amount of information on hand to give your experience in the cemetery depth and color. You won’t just get to see the graves of some famous persons – you will also get to learn facts about their lives, the burial ground and so much more. Founded in 1718, the French Quarter (Vieux Carre – meaning old square) was the original settlement of this 300-year-old city. See the unique architecture and the lush, inviting courtyards as you stroll through the narrow streets, soaking up the charm and ambiance of America’s most interesting city. Learn about the French and Spanish rule and the Louisiana Purchase. 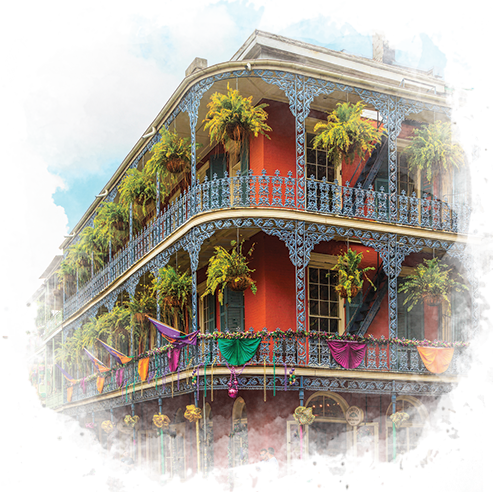 On our French Quarter Tour, you’ll get to see the Cabildo, the Presbytere, the Pontalba Buildings, St. Louis Cathedral, Jackson Square, the Old Ursuline Convent, and many other historically significant locations. Stroll by former residences of William Faulkner and Tennessee Williams; see Cafe du Monde and the Old French Market; learn about Creoles and Cajuns and their unique cuisines. On the Garden District tour, you will stroll the streets of this famous neighborhood and view the stately mansions and lush gardens; see the homes of Archie Manning, John Goodman, and the house where the Confederate President, Jefferson Davis, died. You will visit Lafayette Cemetery.